Semiarundinaria are tall, vigorous and clump-forming bamboos that are native to subtropical woodland areas of China and Japan. Semiarundinaria can be evergreen, semi-deciduous or deciduous depending on the variety. 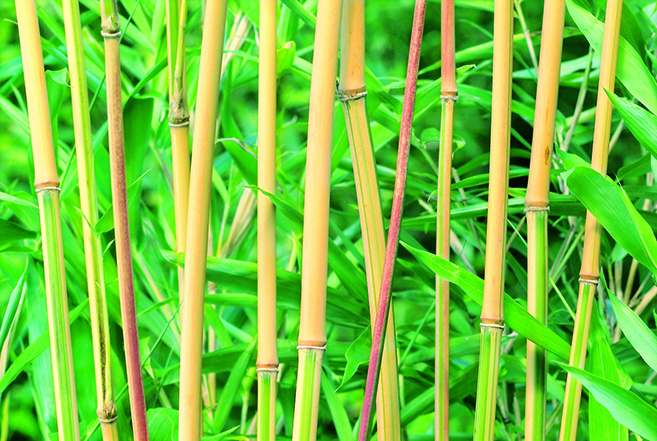 Smooth bamboo canes grow upwards, with tufts of lance-shaped leaves growing at each node. Semiarundinaria are well suited for using as an architectural low-maintenance hedging or screen plants and can be grown in containers too. Semiarundinaria can grow anywhere up to 8m tall, but this does vary depending on the variety and approximate spread is around 2.5m. Semiarundinaria are best planted in moist but well-drained loam-based moderately fertile and humus-rich soil with an acidic, neutral or alkaline PH balance. Choosing an appropriate site to plant is very important, as Semiarundinaria can grow very tall and can become invasive if in warm, moist or favourable conditions so may need controlling. Semiarundinaria can be planted in either a sheltered or exposed site in a position of sun or partial shade. Remove weak, dead, damaged or spindly stems in spring and thin to show off stems to their best effect and remove any debris at the base of clumps. Semiarundinaria will require watering in dry spells, as they prefer moist but well-drained soil. It is possible to propagate Semiarundinaria by young rhizome cuttings or by division in the spring.